Please call Bluegreen Travel Services at 800.459.1597 to learn about similar Germany & Oberammergau Passion Play tours. Choose from Two Departure Dates! June 15-26, 2020 Sold out! September 7-18, 2020 Sold out! Booking deadline is May 31, 2019. The world-famous Oberammergau Passion Play only comes around once a decade, and Bluegreen owners and their guests will be there in 2020! Begun as a promise by villagers to reenact the last week of Jesus Christ’s life if spared the ravages of the Black Death plague, it’s been a theatrical tradition in this Bavarian town for almost 400 years. The Passion Play is just one stop on our guided tour of Germany’s most famous cities, medieval towns and scenic areas, with departure dates in both June and September. With two departures, more owners can take advantage of this once-in-a-lifetime opportunity. See Cologne’s famous gothic cathedral with its twin-steepled towers, Berlin’s historic Brandenburg Gate and Munich’s 1972 Olympics sites. Enjoy a day cruise on the most scenic section of the Rhine River, where fairy-tale castles, terraced vineyards and idyllic villages line the banks. Visit King Ludwig II’s Neuschwanstein Castle, which inspired Walt Disney’s design of Sleeping Beauty Castle in Disneyland. Walk about Rothenburg, a walled town that has retained its medieval character. Watch a woodcarver in action in the Black Forest and sample delicious Black Forest Cake. Ride a funicular railway up to Heidelberg Castle to see the Great Vat, a 58,000-gallon wine cask built in 1751 that has a dance floor on top. This adventure features extra excursions to some important World War II historic sites, like the Dachau concentration camp and the building where the Allied leaders met for the post-war Potsdam Conference. Get a true taste of Germany—including its fine beer and bratwurst—and be a part of Oberammergau’s momentous event. Your adventure begins today with transfers from the Frankfurt airport to your hotel in this bustling metropolis on the Main River. You’ll have time this afternoon to rest or start exploring the city on your own. This evening meet your Tour Director, Bluegreen hosts and fellow Bluegreen owners at a special Welcome Dinner at a local restaurant. Dinner is included today; overnight in Frankfurt. Today enjoy a romantic day cruise along the most scenic section of the Rhine River, with castle-crested hills, terraced vineyards, pretty wine towns and the infamous Lorelei rock. The rock is associated with the legend of a beautiful maiden who threw herself into the Rhine in despair over a faithless lover and was transformed into a siren who lures fishermen to their destruction. Disembark and ride to Cologne to visit the gothic cathedral. Its twin 515-foot towers, five naves, splendid stained-glass windows and the shrine of the Three Holy Kings are eloquent testimony to the quality of medieval engineering and craftsmanship. Enjoy a beer at the Cölner Hofbräu Früh, one of Cologne’s famous breweries. Breakfast is included today; overnight in Cologne. 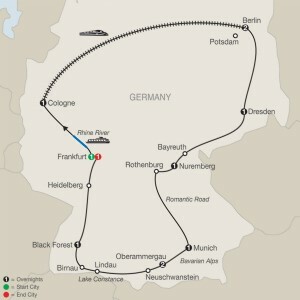 Ride the ICE train to Berlin, capital of reunited Germany. Modern ICE trains are one of the fastest ways to get around in Germany and its neighboring countries. Food is available for purchase at your option aboard the train for lunch. 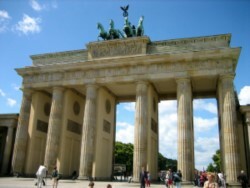 Berlin sightseeing with a Local Guide in the once-divided metropolis includes the elegant Ku’damm, the restored Reichstag, Charlottenburg Palace, a picture stop at monumental Brandenburg Gate and the Holocaust Memorial, and the 210-foot Victory Column in the vast Tiergarten park. Visit the Kaiser Wilhelm Memorial Church with its bomb-damaged tower, drive along Unter den Linden Boulevard and pass the State Opera House and Checkpoint Charlie. Breakfast and dinner are included today; overnight in Berlin. Enjoy time at leisure in Berlin this morning. This afternoon you’ll have an excursion to Potsdam. Stroll through the stunning gardens of Sanssouci Palace. Visit Cecilienhof Palace, the last palace built during the Hohenzollern dynasty. Erected in the early 20th century for Crown Prince Wilhelm and his wife Cecilie von Mecklenburg-Schwerin, the architecture emulates the English Tudor style. This historical building was used by the allied heads of state (U.S. President Harry Truman, Soviet leader Joseph Stalin and British Prime Ministers Winston Churchill and Clement Attlee) in the summer of 1945 for the Potsdam Conference, where the victorious Allies of World War II discussed peace treaties and the post-war order. There is also a chance to see the Glienicker Brücke, the bridge that connects the state capital of Potsdam with the federal capital of Berlin. This was one of the most renowned monuments of the Cold War up to the fall of the Berlin Wall in 1989. The bridge, known as “The Bridge of Spies,” was the location of the famous spy swaps of FBI and KGB secret agents between the United States and the Soviet Union. Tonight savor an extra-special, three-course private group dinner in a local restaurant. Breakfast and dinner are included today; overnight in Berlin. Arrive in Dresden, former capital of Saxony. Badly damaged by Allied bombing in February 1945, the city has since been restored to its baroque splendor. During your orientation tour, see the Zwinger Palace Courtyard and admire its impressive architecture; the magnificent baroque Semper Opera, which was originally built in 1841, destroyed by fire and again by bombing and restored in 1985; and the newly rebuilt Frauenkirche. Breakfast is included today; overnight in Dresden. Stop in Bayreuth for an orientation tour of this festival city. Richard Wagner came to Bayreuth in 1871 and was not satisfied with the existing 18th-century theater, the Markgräfliches Opernhaus, so he had a new one built. Today the Festival Hall is used exclusively for the Bayreuth Festival, and only works by Wagner are performed there. Continue to Nuremberg, the town of children’s toys and gingerbread. Check out the impressive medieval ramparts and walk through the charming Old Town to St. Sebald Church, painstakingly reconstructed as a monument to peace from the rubble of near-total wartime destruction. See the Schöner Brunnen, a 14th-century fountain dedicated to the Holy Roman Empire; spin the two brass rings for good luck. 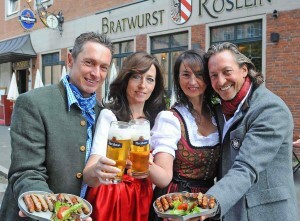 Then enjoy dinner at the Bratwurst Röslein restaurant to taste traditional Nürnberger bratwürste. Breakfast and dinner are included today; overnight in Nuremberg. In medieval Rothenburg examine the ramparts, towers, cobblestone lanes and 16th-century houses during your walking tour. Hear how the town survived the Thirty Years’ War and shop for Christmas ornaments—this pretty town is famous for them. Next head to the Bavarian capital of Munich, known as the beer capital of the world. You’ll find many beer halls, beer gardens and beer cellars here, and it’s the site of Oktoberfest, the world’s largest Volksfest (beer festival), held annually from mid-September to early October. Tonight enjoy a special Bavarian Evening excursion and dive into the heart of Munich’s food and beer culture. Indulge in a three-course Bavarian dinner with a stein of beer (or wine, coffee or soft drink) and be ready to say Prost (cheers)! Breakfast and dinner are included today; overnight in Munich. 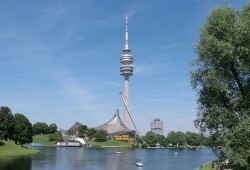 Sightseeing with a Local Guide of Germany’s “Secret Capital” features the Olympic Stadium, built for the 1972 Olympics; the 1,000-foot-high Olympic Tower; and Königsplatz, used for Nazi rallies during World War II. Drive along the Ludwigstrasse and see the Bavarian Arch of Triumph and Field Marshall Hall. Also visit lively Marienplatz with the Old and the New Town Halls and the gothic Frauenkirche. Visit Germany’s first concentration camp near the terraced town of Dachau. It opened in 1933 and became a model for the many SS prison camps that opened later. Flooded by tens of thousands of deportees, the majority of whom were Jews of diverse nationalities, this camp is a chilling reminder of the political persecution during World War II and the Holocaust. In the late afternoon, drive to the romantic Passion Play town of Oberammergau, where you will stay for the next two nights. Breakfast and dinner are included today; overnight in Oberammergau. Enjoy free time this morning and explore this quaint Bavarian alpine village surrounded by majestic mountains and picturesque meadows. Note the painted facades on the chalets, commissioned by wealthy residents in the 18th century. This afternoon and evening are dedicated to the world-famous Oberammergau Passion Play, performed only once a decade from May to October. Begun as a promise by villagers to reenact the last week of Jesus Christ’s life if spared the ravages of the Black Death plague, it’s been a theatrical tradition for almost 400 years. Local actors, musicians and stage technicians are involved in the performances; they must have been born in Oberammergau or lived there for at least 20 years to participate. You’ll have premium seating for this world-famous event, which is presented in two parts: Part I goes from 2:30 to 5 p.m. local time; Part II takes place from 8 to 10:30 p.m. A meal is served at intermission. Breakfast, lunch and dinner are included today; overnight in Oberammergau. 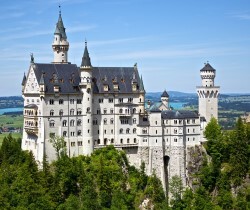 Today starts with a visit to King Ludwig’s magnificent Neuschwanstein Castle. When Walt Disney began construction of the Disneyland theme park in Anaheim, California, he wanted something at the end of Main Street to draw his guests into the park. He decided on a fairy-tale castle. The inspiration for the castle is a place Walt Disney and his wife Lillian visited many years before on a European vacation, Neuschswanstein Castle. The resemblance between the two castles is uncanny, and the architectural features are undeniable. Follow your Local Guide through this castle on its craggy outcrop high above a sparkling lake. Then continue along the panoramic German Alpine Road to the sunny northern shore of Lake Constance, Europe’s largest freshwater reservoir. Visit the charming island of Lindau and the baroque church at Birnau before entering the lush Black Forest. Breakfast and dinner are included today; overnight in the Black Forest. This morning drive deeper into the Black Forest and watch a woodcarving demonstration, followed by Kaffee und Schwarzwaldkuchen (coffee and Black Forest Cake). Arrive in Heidelberg, Germany’s oldest university town, which features prominently in “The Student Prince” novel, operetta and silent movie. Stroll around in the Old Town and ride the funicular railway up the hill to visit the red-walled Heidelberg Castle, where you’ll see the Great Vat, a 58,000-gallon wine barrel built in 1751. One hundred and thirty oak trees were reputedly used in its construction. It has only rarely been used as a wine barrel, and in fact presently enjoys more use as a tourist attraction. Stairs lead to a dance floor on top of the Vat. Return to Frankfurt this evening. Say auf Wiedersehen to your fellow adventurers at a special Farewell Dinner at a local restaurant. Breakfast and dinner are included today; overnight in Frankfurt. Your adventure ends with breakfast and transfers to the airport. Call 800.459.1597 to Book Your Germany & Oberammergau Adventure Today! Prices and accommodations based on availability, per person double occupancy and subject to change without notice. Includes accommodations; some meals; on-tour first-class ICE train transportation, Cologne to Berlin; on-tour motorcoach transportation; funicular railway ride in Heidelberg; guided sightseeing; admission to Oberammergau Passion Play; admission to attractions; airport transfers in Frankfurt at start and end of tour (on June 15 and 26, 2020 or September 7 and 18, 2020); hotel luggage handling; gratuities for tour manager, local guides and driver; and taxes. Fares shown are in U.S. dollars for new reservations only and are subject to availability. Not included: airfare; airline fees; airport or departure taxes; vacation insurance; gratuities for hotel housekeepers; alcohol, food and beverages outside of the contracted Globus menu as presented at a hotel or restaurant; optional excursions; vacation insurance for non-U.S. residents; and any incidental charges. Cancellation fees apply. 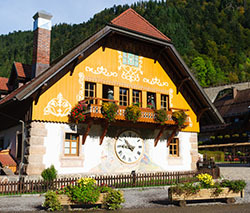 Price is per person based on double occupancy and includes accommodations; some meals; on-tour first-class ICE train transportation, Cologne to Berlin; on-tour motorcoach transportation; funicular railway ride in Heidelberg; Potsdam excursion; Bavarian Evening excursion in Munich; Dachau excursion at Munich; Berlin dinner excursion; guided sightseeing; admission to Oberammergau Passion Play; admission to attractions; airport transfers in Frankfurt at start and end of tour (on June 15 and 26, 2020 or September 7 and 18, 2020); hotel luggage handling; gratuities for tour manager, local guides and driver; and taxes. Reservations must be booked by May 31, 2019. Nonrefundable, non-transferrable deposit of $1,000 per person is due at time of booking. Final payment for June departure due by March 15, 2020; final payment for September departure due by May 15, 2020. Prices, additional fees, itineraries and availability are subject to change without notice. Certain terms, conditions, and restrictions may apply. Please call us at 800.459.1597 for additional information. Fares shown are in U.S. dollars for new reservations only and are subject to availability. Not included: airfare; government taxes and fees; vacation insurance; gratuities for hotel housekeepers; alcohol, beverages and food outside the contracted Globus menu as presented at a hotel or restaurant; optional excursions; baggage fees; and all other items of a personal nature. Great Vacation Destinations, doing business as Bluegreen Travel Services, is located at 12400 S. International Drive, Orlando, FL 32821. Great Vacation Destinations is a registered Florida Seller of Travel, license no. ST36225, a California Seller of Travel, Reg. No. 2083124-50 (Registration as a seller of travel does not constitute approval by the State of California), and Washington Seller of Travel, Reg. No. 602511860; and registered with the Airlines Reporting Corporation (“ARC”) number 15-72225-4. Void where prohibited by law and where registration and/or licensing requirements have not been met. In the event of a conflict between Globus’ Details of Participation and Great Vacation Destinations’ Details of Participation, Globus’ Details of Participation shall govern.